I have been on the national team competing for Canada for over 24 years. It’s a career that has brought so much joy, as well as some heartache. Many times I have had the honour of being on top of the podium, with a gold medal around my neck, watching the Canadian flag being raised while the anthem plays. Those moments are certainly a high point and the very thing that every athlete strives to achieve. When people ask me to pick my top highlight or the best moment of my career, they expect me to say winning gold. But looking back over those two-plus decades of training, competing, winning and losing, those podiums are significant but so are many other parts of my life that are just as significant or important to me. These moments, the less known or less obvious ones, make me smile as I realize how rich my career and life have been. While watching Alex Baumann win his Olympic gold medals in swimming at the 1984 Los Angeles Games, I knew what I wanted to do with my life. I can remember the certainty and forcefulness of my declaration to my mom: I would one day win Canada a gold medal at the Olympic Games. There was no laughter or derision, but rather a challenge of putting a plan together to achieve that goal. Then, at the age of 9 ½ , that plan went off the rails when I was paralyzed during a surgery on my spine. My life went from riding my bike, playing street hockey and swimming, to learning how to sit up again, transfer from my bed to a wheelchair, and navigate my very inaccessible world in that wheelchair. My dream of winning Canada a gold medal seemed impossible and unrealistic. A few years later, my mother discovered Variety Village – a fully inclusive sport and fitness centre that offers a number of Paralympic sports. 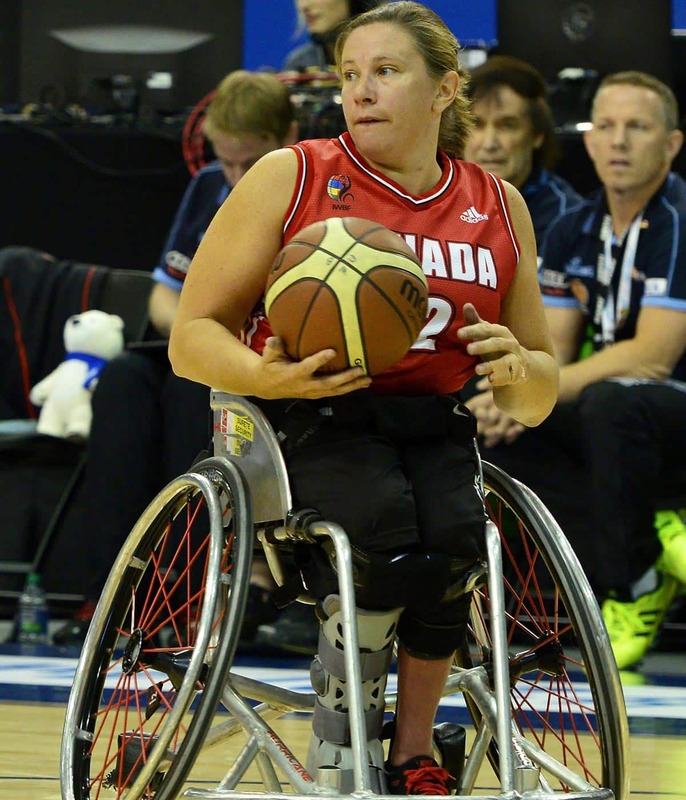 On my first day, I was exposed to a whole new world of sport that once again made the dream of winning a medal for Canada a possibility, only this time at the Paralympics. While I tried tennis, racing and basketball that first day, it was basketball that I fell in love with despite it not being a logical fit for me. I was (and still am) small, and at first I was not able to make a basket. However, I loved the team aspect and while I could no longer play basketball standing up, my friends could come to Variety Village and sit in a wheelchair and play basketball with me. I have had the honour of representing Canada all over the world. I have experienced the awe of marching into an Olympic opening ceremony with over 80,000 people cheering our nation. I have won three Paralympic gold medals and four world championships. But I want to share some of the things that have great meaning for me outside of the medals, those experiences, people or moments that make me smile on the days where training is hard, life is getting a little crazy, or to remind myself why I do this. I remember after my paralysis mom expected me to “pull my weight” and do chores just like my brothers and sister. My list of chores changed to things that I was able to do, but I was still expected to be a contributing member of the household. This showed me that I am no different than anyone else. There were expectations for me and I had a role to play. At my Grade 8 graduation from Reesor Park Public School (Markham, Ont. ), after all the athletic awards were handed out, I was called to the stage and awarded an honourary athletic letter. There were no wheelchair sports at my school, but they chose to acknowledge that I was training and playing sports in the same way as my classmates who had earned their letters. My first two coaches in wheelchair basketball, Joe Millage and Steve Bialowas, created an environment that did not just teach young kids the technical aspects of the sport, but encouraged each person to reach for their own personal potential, that every athlete at training was important, to believe in ourselves and each other. Some of the best moments of my career were as a teenager, travelling with this team, the silly stories, jokes and a camaraderie that despite happening over 25 years ago, created a lasting bond with those teammates. I have been blessed with many amazing teammates over the years, but those first years, under the leadership of those coaches, taught me how to enjoy the game while striving for greatness. Every time I step onto a gym floor for a game, there are volunteers, score keepers, referees and fans that have given up their time to create an opportunity for me to play the sport I love. I owe them more “thank yous” than I can ever deliver. If you have ever volunteered at an event where I have competed, please know that I appreciate you. I was touched by a letter sent to me by a student whose school I spoke at. It contained some inspirational words. That letter reminds me that a gold medal is nice, but encouraging someone to believe in themselves is also golden. My family has logged many hours in a gym, or driving to a gym, or rebounding for me on a gym floor. They have listened to me when I needed an ear, cheered me on and just been there for me - win or lose. I cannot imagine doing this without them. I have had a role model from my first day of life, who taught me I could never fail so long as I tried, that with hard work, determination (and a little luck), I could achieve my dreams. That same person showed me unconditional love, support and what true strength is. On days I wonder if I can keep going, I look to my mother’s example for our family and know that I can. I continue to work to be on top of the podium with my teammates, watching the Canadian flag rise while the anthem plays. If you see me up there smiling, you will know that it is not just because we won. I am thinking about all those moments along the way to the podium that made the gold possible, and all those people who have supported me throughout the years as I pursue and realize my dreams.